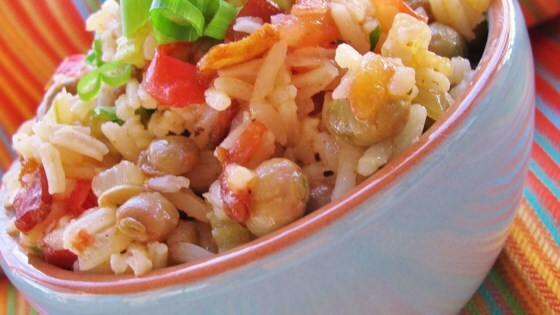 "Peas and rice, often served under a tropical sun. You may have had it last while sitting on soft white sand, and looking at a clear blue sea. Goes excellently with other traditional Caribbean fare, such as chicken curry or souse." Melt butter in a large, heavy saucepan over medium high heat. Place bacon in the saucepan, and cook until evenly brown. Stir in onion and celery, and cook until tender. Mix in tomato, tomato paste, and ketchup. Season with salt and pepper. Reduce heat to low, and continue cooking about 15 minutes. Stir pigeon peas and their liquid, water, rice, and thyme into the saucepan. Bring to a boil, cover, and reduce heat. Cook 40 minutes on low, or until all liquid is absorbed. Fluff rice with a fork. This easy fried rice goes with just about any entrée. My husband is from the Bahamas and I have yet to find a recipe that is most like his. This one is missing a few ingredients such as the coconut milk and the salt pork.